An Economic Sense | It's the Economy, Stupid! The Bureau of Economic Analysis (BEA) released earlier today its second estimate of GDP growth in the fourth quarter ot 2018. (Confusingly, it was officially called the “third” estimate, but was only the second as what would have been the first, due in January, was never done due to Trump shutting down most agencies of the federal government in December and January due to his border wall dispute.) Most public attention was rightly focussed on the downward revision in the estimate of real GDP growth in the fourth quarter, from a 2.6% annual rate estimated last month, to 2.2% now. And current estimates are that growth in the first quarter of 2019 will be substantially less than that. But there is much more in the BEA figures than just GDP growth. The second report of the BEA also includes initial estimates of corporate profits and the taxes they pay (as well as much else). The purpose of this note is to update an earlier post on this blog that examined what happened to corporate profit tax revenues following the Trump / GOP tax cuts of late 2017. That earlier post was based on figures for just the first half of 2018. We now have figures for the full year, and they confirm what had earlier been found – corporate profit tax revenues have indeed plummeted. 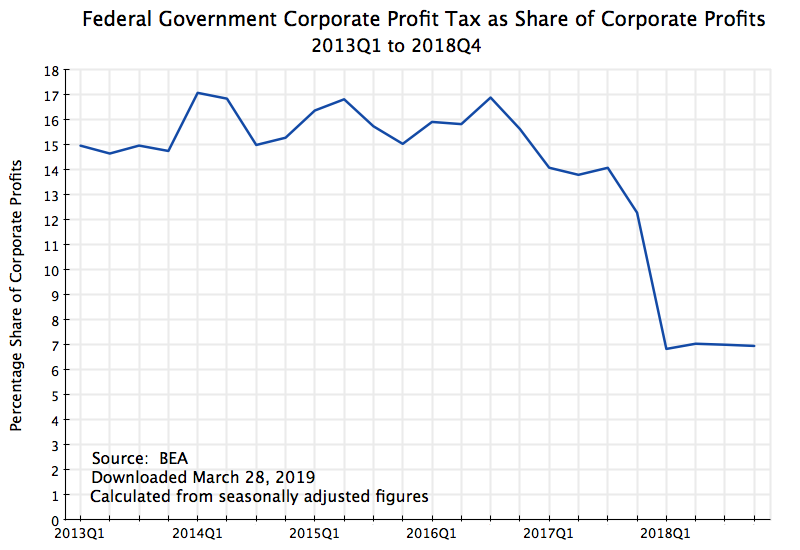 As seen in the chart at the top of this post, corporate profit taxes were in the range of only $150 to $160 billion (at annual rates) in the four quarters of 2018. This was less than half the $300 to $350 billion range in the years before 2018. And there is no sign that this collapse in revenues was due to special circumstances of one quarter or another. We see it in all four quarters. 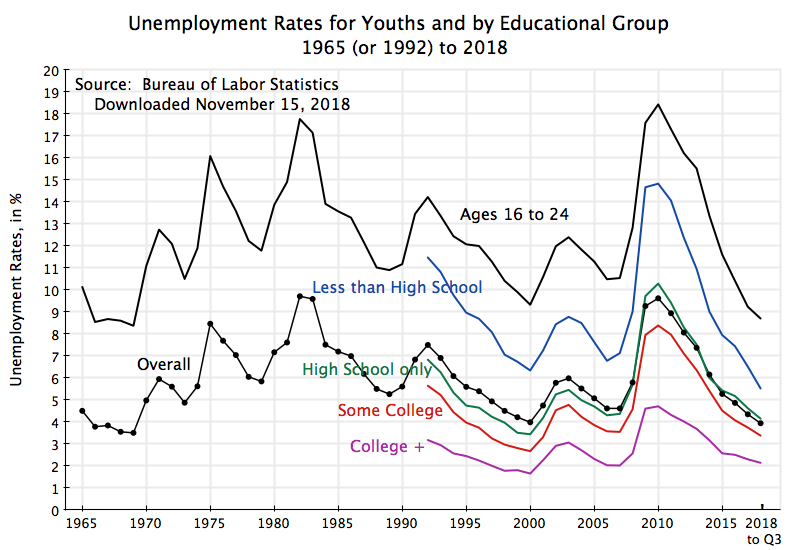 The rate fell from a range of generally 15 to 16%, and sometimes 17%, in the earlier years, to just 7.0% in 2018. And it was an unusually steady rate of 7.0% throughout the year. Note that under the Trump / GOP tax bill, the standard rate for corporate profit tax was cut from 35% previously to a new headline rate of 21%. But the actual rate paid turned out (on average over all firms) to come to just 7.0%, or only one-third as much. The tax bill proponents claimed that while the headline rate was being cut, they would close loopholes so the amount collected would not go down. But instead loopholes were not only kept, but expanded, and revenues collected fell by more than half. 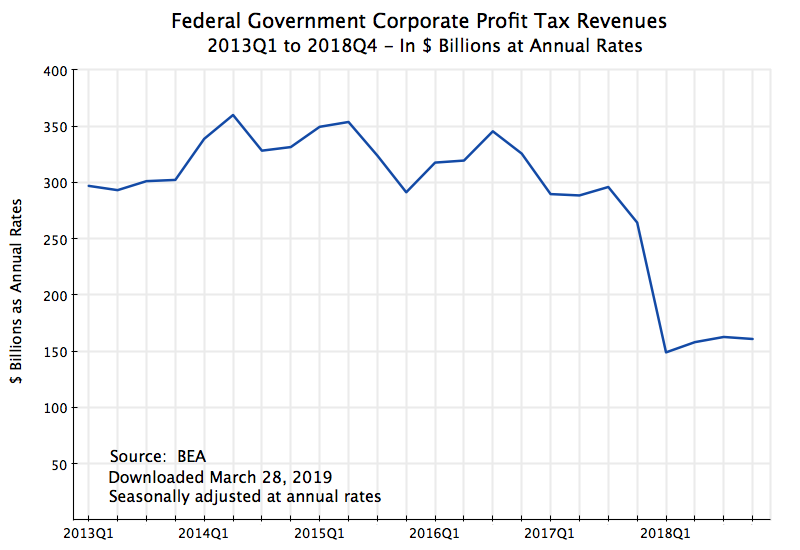 If the average corporate profit tax rate paid in 2018 had been not 7.0%, but rather at the rate it was on average over the three prior fiscal years (FY2015 to 2017) of 15.5%, an extra $192.2 billion in revenues would have been collected. There was also a reduction in personal income taxes collected. While the proportional fall was less, a much higher share of federal income taxes are now borne by individuals than by corporations. (They were more evenly balanced decades ago, when the corporate profit tax rates were much higher – they reached over 50% in terms of the amount actually collected in the early 1950s.) Federal personal income tax as a share of personal income was 9.2% in 2018, and again quite steady at that rate over each of the four quarters. Over the three prior fiscal years of FY2015 to 2017, this rate averaged 9.6%. Had it remained at that 9.6%, an extra $77.3 billion would have been collected in 2018. The total reduction in tax revenues from these two sources in 2018 was therefore $270 billion. While it is admittedly simplistic to extrapolate this out over ten years, if one nevertheless does (assuming, conservatively, real growth of 1% a year and price growth of 2%, for a total growth of about 3% a year), the total revenue loss would sum to $3.1 trillion. And if one adds to this, as one should, the extra interest expense on what would now be a higher public debt (and assuming an average interest rate for government borrowing of 2.6%), the total loss grows to $3.5 trillion. This is huge. To give a sense of the magnitude, an earlier post on this blog found that revenues equal to the original forecast loss under the Trump / GOP tax plan (summing to $1.5 trillion over the next decade, and then continuing) would suffice to ensure the Social Security Trust Fund would be fully funded forever. As things are now, if nothing is done the Trust Fund will run out in about 2034. And Republicans insist that the gap is so large that nothing can be done, and that the system will have to crash unless retired seniors accept a sharp reduction in what are already low benefits. But with losses under the Trump / GOP tax bill of $3.1 trillion over ten years, less than half of those losses would suffice to ensure Social Security could survive at contracted benefit levels. One cannot argue that we can afford such a huge tax cut, but cannot afford what is needed to ensure Social Security remains solvent. In the nearer term, the tax cuts have led to a large growth in the fiscal deficit. Even the US Treasury itself is currently forecasting that the federal budget deficit will reach $1.1 trillion in FY2019 (5.2% of GDP), up from $779 billion in FY2018. It is unprecedented to have such high fiscal deficits at a time of full employment, other than during World War II. Proper fiscal management would call for something closer to a balanced budget, or even a surplus, in those periods when the economy is at full employment, while deficits should be expected (and indeed called for) during times of economic downturns, when unemployment is high. But instead we are doing the opposite. This will put the economy in a precarious position when the next economic downturn comes. And eventually it will, as it always has. There is little that is as destructive to a democracy as gerrymandering. As has been noted by many, with gerrymandering the politicians are choosing their voters rather than the voters choosing their political representatives. 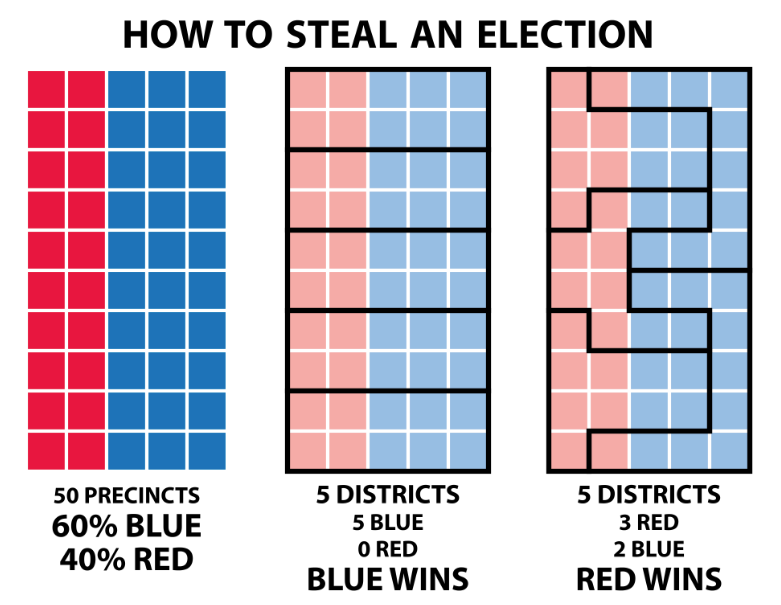 The diagrams above, in schematic form, show how gerrymandering works. Suppose one has a state or region with 50 precincts, with 60% that are fully “blue” and 40% that are fully “red”, and where 5 districts need to be drawn. If the blue party controls the process, they can draw the district lines as in the middle diagram, and win all 5 (100%) of the districts, with just 60% of the voters. If, in contrast, the red party controls the process for some reason, they could draw the district boundaries as in the diagram on the right. They would then win 3 of the 5 districts (60%) even though they only account for 40% of the voters. It works by what is called in the business “packing and cracking”: With the red party controlling the process, they “pack” as many blue voters as possible into a small number of districts (two in the example here, each with 90% blue voters), and then “crack” the rest by scattering them around in the remaining districts, each as a minority (three districts here, each with 40% blue voters and 60% red). Gerrymandering leads to cynicism among voters, with the well-founded view that their votes just do not matter. Possibly even worse, gerrymandering leads to increased polarization, as candidates in districts with lines drawn to be safe for one party or the other do not need to worry about seeking to appeal to voters of the opposite party. Rather, their main concern is that a more extreme candidate from their own party will not challenge them in a primary, where only those of their own party (and normally mostly just the more extreme voters in their party) will vote. And this is exactly what we have seen, especially since 2010 when gerrymandering became more sophisticated, widespread, and egregious than ever before. Gerrymandering has grown in recent decades both because computing power and data sources have grown increasingly sophisticated, and because a higher share of states have had a single political party able to control the process in full (i.e. with both legislative chambers, and the governor when a part of the process, all under a single party’s control). And especially following the 2010 elections, this has favored the Republicans. As a result, while there has been one Democratic-controlled state (Maryland) on common lists of the states with the most egregious gerrymandering, most of the states with extreme gerrymandering were Republican-controlled. Thus, for example, Professor Samuel Wang of Princeton, founder of the Princeton Gerrymandering Project, has identified a list of the eight most egregiously gerrymandered states (by a set of criteria he has helped develop), where one (Maryland) was Democratic-controlled, while the remaining seven were Republican. Or the Washington Post calculated across all states an average of the degree of compactness of congressional districts: Of the 15 states with the least compact districts, only two (Maryland and Illinois) were liberal Democratic-controlled states. And in terms of the “efficiency gap” measure (which I will discuss below), seven states were gerrymandered following the 2010 elections in such a way as to yield two or more congressional seats each in their favor. All seven were Republican-controlled. With gerrymandering increasingly common and extreme, a number of cases have gone to the Supreme Court to try to stop it. However, the Supreme Court has failed as yet to issue a definitive ruling ending the practice. Rather, it has so far skirted the issue by resolving cases on more narrow grounds, or by sending cases back to lower courts for further consideration. This may soon change, as the Supreme Court has agreed to take up two cases (affecting lines drawn for congressional districts in North Carolina and in Maryland), with oral arguments scheduled for March 26, 2019. But it remains to be seen if these cases will lead to a definitive ruling on the practice of partisan gerrymandering or not. This is not because of a lack of concern by the court. Even conservative Justice Samuel Alito has conceded that “gerrymandering is distasteful”. But he, along with the other conservative justices on the court, have ruled against the court taking a position on the gerrymandering cases brought before it, in part, at least, out of the concern that they do not have a clear standard by which to judge whether any particular case of gerrymandering was constitutionally excessive. This goes back to a 2004 case (Vieth v. Jubelirer) in which the four most conservative justices of the time, led by Justice Antonin Scalia, opined that there could not be such a standard, while the four liberal justices argued that there could. Justice Anthony Kennedy, in the middle, issued a concurring opinion with the conservative justices there was not then an acceptable such standard before them, but that he would not preclude the possibility of such a standard being developed at some point in the future. Following this 2004 decision, political scientists and other scholars have sought to come up with such a standard. Many have been suggested, such as a set of three tests proposed by Professor Wang of Princeton, or measures that focus on the share of seats won to the share of the votes cast, and more. 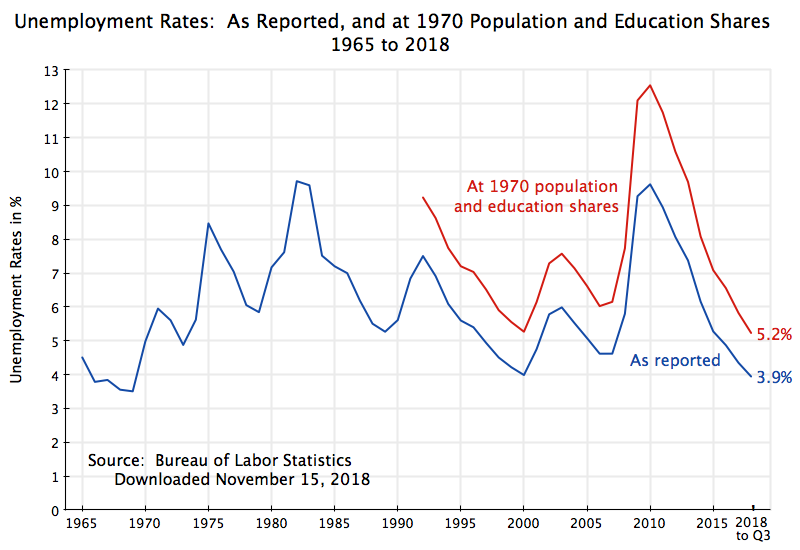 Probably most attention in recent years has been given to the “efficiency gap” measure proposed by Professor Nicholas Stephanopoulos and Eric McGhee. The efficiency gap is the gap between the two main parties in the “wasted votes” each party received in some past election in the state (as a share of total votes in the state), where a wasted vote is the sum of all the votes for a losing candidate of that party, plus the votes in excess of 50% when that party’s candidate won. This provides a direct measure of the two basic tactics of gerrymandering, as described above, of “packing” as many voters of one party as possible in a small number of districts (where they might receive 80 or 90% of the votes, but with all those above 50% “wasted”), and “cracking” (by splitting up the remaining voters of that party into a large number of districts where they will each be in a minority and hence will lose, with those votes then also “wasted”). But there are problems with each of these measures, including the widely touted efficiency gap measure. It has often been the case in recent years, in our divided society, that like-minded voters live close to each other, and particular districts in the state then will, as a result, often see the winner of the district receive a very high share of the votes. Thus, even with no overt gerrymandering, the efficiency gap as measured will appear large. Furthermore, at the opposite end of this spectrum, the measure will be extremely sensitive if a few districts are close to 50/50. A shift of just a few percentage points in the vote will then lead one party or the other to lose and hence will then see a big jump in their share of wasted votes (the 49% received by one party or the other). There is, however, a far more fundamental problem. And that is that this is simply the wrong question to ask. With all due respect to Justice Kennedy, and recognizing also that I am an economist and not a lawyer, I do not understand why the focus here is on the voting outcome, rather than on the process by which the district lines were drawn. The voting outcome is not the standard by which other aspects of voter rights are judged. Rather, the focus is on whether the process followed was fair and unbiased, with the outcome then whatever it is. I would argue that the same should apply when district lines are drawn. Was the process followed fair and unbiased? The way to ensure that would be to remove the politicians from the process (both directly and indirectly), and to follow instead an automatic procedure by which district lines are drawn in accord with a small number of basic principles. The next section below will first discuss the basic point that the focus when judging fairness and lack of bias should not be on whether we can come up with some measure based on the vote outcomes, but rather on whether the process that was followed to draw the district lines was fair and unbiased or not. The section following will then discuss a particular process that illustrates how this could be done. It would be automatic, and would produce a fair and unbiased drawing of voting district lines that meets the basic principles on which such a map should be based (districts of similar population, compactness, contiguity, and, to the extent consistent with these, respect for the boundaries of existing political jurisdictions such as counties or municipalities). And while I believe this particular process would be a good one, I would not exclude that others are possible. The important point is that the courts should require the states to follow some such process, and from the example presented we see that this is indeed feasible. It is not an impossible task. The penultimate section of the post will then discuss a few points that arise with any such system, and their implications, and end with a brief section summarizing the key points. Voting rights are fundamental in any democracy. But in judging whether some aspect of the voting system is proper, we do not try to determine whether or not (by some defined specific measure) the resulting outcomes were improperly skewed or not. Thus, for example, we take as a basic right that our ballot may be cast in secret. No government official, nor anyone else for that matter, can insist on seeing how we voted. Suppose that some state passed a law saying a government-appointed official will look over the shoulder of each of us as we vote, to determine whether we did it “right” or not. We would expect the courts to strike this down, as an inappropriate process that contravenes our basic voting rights. We would not expect the courts to say that they should look at the subsequent voting outcomes, and try to come up with some specific measure which would show, with certainty, whether the resulting outcomes were excessively influenced or not. That would of course be absurd. As another absurd example, suppose some state passed a law granting those registered in one of the major political parties, but not those registered in the other, access to more early days of voting than the other. This would be explicitly partisan, and one would assume that the courts would not insist on limiting their assessment to an examination of the later voting outcomes to see whether, by some proposed measure, the resulting outcomes were excessively affected. The voting system, to be fair, should not lead to a partisan advantage for one party or the other. But gerrymandering does precisely that. And in the case of Maryland, the Democratic governor of the state in 2010 at the time the congressional district lines were drawn, Martin O’Malley, spoke out in 2018 in writing and in interviews openly acknowledging that he and the Democrats had drawn the district lines for partisan advantage. But he also now said that this was wrong and that he hoped the Supreme Court would rule against what they had done. But how to remove partisanship when district lines are drawn? As long as politicians are directly involved, with their political futures (and those of their colleagues) dependent on the district lines, it is human nature that biases will enter. And it does not matter whether the biases are conscious and openly expressed, or unconscious and denied. Furthermore, although possibly diminished, such biases will still enter even with independent commissions drawing the district lines. There will be some political process by which the commissioners are appointed, and those who are appointed, even if independent, will still be human and will have certain preferences. The way to address this would rather be to define some automatic process which, given the data on where people live and the specific principles to follow, will be able to draw up district lines that are both fair (follow the stated principles) and unbiased (are not drawn up in order to provide partisan advantage to one party). In the next section I will present a particular process that would do this. c) Compactness: While remaining consistent with the above, districts should be as compact as possible under some specified measure of compactness. And while not such a fundamental principle, a reasonable objective is also, to the extent possible consistent with the basic principles above, that the district boundaries drawn should follow the lines of existing political jurisdictions (such as of counties or municipalities). There will still be a need for decisions to be made on the basic process to follow and then on a number of the parameters and specific rules required for any such process. Individual states will need to make such decisions, and can do so in accordance with their traditions and with what makes sense for their particular state. But once these “rules of the game” are fully specified, there should then be a requirement that they will remain locked in for some lengthy period (at least to beyond whenever the next decennial redistricting will be needed), so that games cannot be played with the rules in order to bias a redistricting that may soon be coming up. This will be discussed further below. Such specific decisions will need to be made in order to fully define the application of the basic principles presented above. To start, for the one person – one vote principle the Supreme Court has ruled that a 10% margin in population between the largest and smallest districts is an acceptable standard. And many states have indeed chosen to follow this standard. However, a state could, if it wished, choose to use a tighter standard, such as a margin in the populations between the largest and smallest districts of no more than 8%, or perhaps 5% or whatever. A choice needs to be made. Similarly, a specific measure of compactness will need to be specified. Mathematically there are several different measures that could be used, but a good one which is both intuitive and relatively easy to apply is that the sum of the lengths of all the perimeters of each of the districts in the state should be minimized. Note that since the outside borders of the state itself are fixed, this sum can be limited just to the perimeters that are internal to the state. In essence, since states are to be divided up into component districts (and exhaustively so), the perimeter lines that do this with the shortest total length will lead to districts that are compact. There will not be wavy lines, nor lines leading to elongated districts, as such lines will sum to a greater total length than possible alternatives. What, then, would be a specific process (or algorithm) which could be used to draw district lines? I will recommend one here, which should work well and would be consistent with the basic principles for a fair and unbiased set of district boundaries. But other processes are possible. A state could choose some such alternative (but then should stick to it). The important point is that one should define a fully specified, automatic, and neutral process to draw such district lines, rather than try to determine whether some set of lines, drawn based on the “judgment” of politicians or of others, was “excessively” gerrymandered based on the voting outcomes observed. Finally, the example will be based on what would be done to draw congressional district lines in a state. But one could follow a similar process for drawing other such district lines, such as for state legislative districts. Step 1: The first step would be to define a set of sub-districts within each county in a state (parish in Louisiana) and municipality (in those states where municipalities hold similar governmental responsibilities as a county). These sub-districts would likely be the districts for county boards or legislative councils in most of the states, and one might typically have a dozen or more of these in such jurisdictions. When those districts are also being redrawn as part of the decennial redistricting process, then they should be drawn first (based on the principles set out here), before the congressional district lines are drawn. Each state would define, as appropriate for the institutions of that specific state, the sub-districts that will be used for the purpose of drawing the congressional district lines. And if no such sub-jurisdictions exist in certain counties of certain states, one could draw up such sub-districts, purely for the purposes of this redistricting exercise, by dividing such counties into compact (based on minimization of the sum of the perimeters), equal population, districts. While the number of such sub-districts would be defined (as part of the rules set for the process) based on the population of the affected counties, a reasonable number might generally be around 12 or 15. These sub-districts will then be used in Step 4 below to even out the congressional districts. Step 2: An initial division of each state into a set of tentative congressional districts would then be drawn based on minimizing the sum of the lengths of the perimeter lines for all the districts, and requiring that all of the districts in the state have exactly the same population. Following the 2010 census, the average population in a congressional district across the US was 710,767, but the exact number will vary by state depending on how many congressional seats the state was allocated. Step 3: This first set of district lines will not, in general, follow county and municipal lines. In this step 3, the initial set of district lines would then be shifted to the county or municipal line which is geographically closest to it (as defined by minimizing the geographic area that would be shifted in going to that county or city line, in comparison to whatever the alternative jurisdiction would be). If the populations in the resulting congressional districts are then all within the 10% margin for the populations (or whatever percent margin is chosen by the state) between the largest and the smallest districts, then one is finished and the map is final. Step 4: But in general, there may be one or more districts where the resulting population exceeds or falls short of the 10% limit. One would then make use of the political subdivisions of the counties and municipalities defined in Step 1 to bring them into line. A specific set of rules for that process would need to be specified. One such set would be to first determine which congressional district, as then drawn, deviated most from what the mean population should be for the districts in that state. Suppose that district had too large of a population. One would then shift one of the political subdivisions in that district from it to whichever adjacent congressional district had the least population (of all adjacent districts). And the specific political subdivision shifted would then be the one which would have the least adverse impact on the measure of compactness (the sum of perimeter lengths). Note that the impact on the compactness measure could indeed be positive (i.e. it could make the resulting congressional districts more compact), if the political subdivision eligible to be shifted were in a bend in the county or city line. If the resulting congressional districts were all now within the 10% population margin (or whatever margin the state had chosen as its standard), one would be finished. But if this is not the case, then one would repeat Step 4 over and over as necessary, each time for whatever district was then most out of line with the 10% margin. That is it. The result would be contiguous and relatively compact congressional districts, each with a similar population (within the 10% margin, or whatever margin is decided upon), and following borders of counties and municipalities or of political sub-divisions within those entities. This would of course all be done on the computer, and can be once the rules and parameters are all decided as there will no longer be a role for opinion nor an opportunity for political bias to enter. And while the initial data entry will be significant (as one would need to have the populations and perimeter lengths of each of the political subdivisions, and those of the counties and municipalities that they add up to), such data are now available from standard sources. Indeed, the data entry needed would be far less than what is typically required for the computer programs used by our politicians to draw up their gerrymandered maps. a) The Redistricting Process, Once Decided, Should be Locked In for a Long Period: As was discussed above, states will need to make a series of decisions to define fully the specific process it chooses to follow. As illustrated in the case discussed above, states will need to decide on matters such as what will be the maximum margin of the populations between the largest and smallest districts (no more than 10%, by Supreme Court decision, but it could be less). And rules will need to be set on, also as in the case discussed above, what measure of compactness to use, or the criterion on which district should be chosen first to have a shift of a sub-district in order to even out the population differences, and so on. Such decisions will have an impact on the final districts arrived at. And some of those districts will favor Republicans and some will favor Democrats, just by random. There would then be a problem if the redistricting were controlled by one party in the state, and that party (through consultants who specialize in this) tried out dozens if not hundreds of possible choices on the parameters to see which would turn out to be most advantageous to it. While the impact would be far less than what we have now with the deliberate gerrymandering, there could still be some effect. To stem this, one should require that once choices are made on the process to follow and on the rules and other parameters needed to implement that process, there could not then be a change in that process for the immediately upcoming decennial redistricting. They would only apply to those following. While this would not be possible for the very first application of the system, there will likely be a good deal of attention paid by the public to these issues initially so such an attempt to bias the system would be difficult. As noted, this is not likely to be a major problem, and any such system will not introduce the major biases we have seen in the deliberately gerrymandered maps of numerous states following the 2010 census. But by locking in any decisions made for a long period, where any random bias in favor of one party in a map might well be reversed following the next census, there will be less of a possibility to game the system by changing the rules, just before a redistricting is due, to favor one party. b) Independent Commissions Do Not Suffice – They Still Need to Decide How to Draw the District Maps: A reform that has been increasingly advocated by many in recent years is to take the redistricting process out of the hands of the politicians, and instead to appoint independent commissions to draw up the maps. There are seven states currently with non-partisan or bipartisan, nominally independent, commissions that draw the lines for both congressional and state legislative districts, and a further six who do this for state legislative districts only. Furthermore, several additional states will use such commissions starting with the redistricting that follows the 2020 census. Finally, there is Iowa. While technically not an independent commission, district lines in Iowa are drawn up by non-partisan legislative staff, with the state legislature then approving it or not on a straight up or down vote. If not approved, the process starts over, and if not approved after three votes it goes to the Iowa Supreme Court. While certainly a step in the right direction, a problem with such independent commissions is that the process by which members are appointed can be highly politicized. And even if not overtly politicized, the members appointed will have personal views on who they favor, and it is difficult even with the best of intentions to ensure such views do not enter. But more fundamentally, even a well-intentioned independent commission will need to make choices on what is, and what is not, a “good” district map. While most states list certain objectives for the redistricting process in either their state constitutions or in legislation, these are typically vague, such as saying the maps should try to preserve “communities of interest”, but with no clarity on what this in practice means. Thirty-eight states also call for “compactness”, but few specify what that really means. Indeed, only two states (Colorado and Iowa) define a specific measure of compactness. Both states say that compactness should be measured by the sum of the perimeter lines being minimized (the same measure I used in the process discussed above). However, in the case of Iowa this is taken along with a second measure of compactness (the absolute value of the difference between the length and the width of a district), and it is not clear how these two criteria are to be judged against each other when they differ. Furthermore, in all states, including Colorado and Iowa, the compactness objective is just one of many objectives, and how to judge tradeoffs between the diverse objectives is not specified. Even a well-intentioned independent commission will need to have clear criteria to judge what is a good map and what is not. But once these criteria are fully specified, there is then no need for further opinion to enter, and hence no need for an independent commission. c) Appropriate and Inappropriate Principles to Follow: As discussed above, the basic principles that should be followed are: 1) One person – One vote, 2) Contiguity, and 3) Compactness. Plus, to the extent possible consistent with this, the lines of existing political jurisdictions of a state (such as counties and municipalities) should be respected. But while most states do call for this (with one person – one vote required by Supreme Court decision, but decided only in 1964), they also call for their district maps to abide by a number of other objectives. Examples include the preservation of “communities of interest”, as discussed above, where 21 states call for this for their state legislative districts and 16 for their congressional districts (where one should note that congressional districting is not relevant in 7 states as they have only one member of Congress). Further examples of what are “required” or “allowed” to be considered include preservation of political subdivision lines (45 states); preservation of “district cores” (8 states); and protection of incumbents (8 states). Interestingly, 10 states explicitly prohibit consideration of the protection of incumbents. And various states include other factors to consider or not consider as well. But many, indeed most, of these considerations are left vague. What does it mean that “communities of interest” are to be preserved where possible? Who defines what the relevant communities are? What is the district “core” that is to be preserved? And as discussed above, there is a similar issue with the stated objective of “compactness”, as while 38 states call for it, only Colorado and Iowa are clear on how it is defined (but then vague on what trade-offs are to be accepted against other objectives). The result of such multiple objectives, mostly vaguely defined and with no guidance on trade-offs, is that it is easy to come up with the heavily gerrymandered maps we have seen and the resulting strong bias in favor of one political party over the other. Any district can be rationalized in terms of at least one of the vague objectives (such as preserving a “community of interest”). These are loopholes which allow the politicians to draw maps favorable to themselves, and should be eliminated. d) Racial Preferences: The US has a long history of using gerrymandering (as well as other measures) to effectively disenfranchise minority groups, in particular African-Americans. This has been especially the case in the American South, under the Jim Crow laws that were in effect through to the 1960s. The Voting Rights Act of 1965 aimed to change this. It required states (in particular under amendments to Section 2 passed in 1982 when the Act was reauthorized) to ensure minority groups would be able to have an effective voice in their choice of political representatives, including, under certain circumstances, through the creation of congressional and other legislative districts where the previously disenfranchised minority group would be in the majority (“majority-minority districts”). However, it has not worked out that way. Indeed, the creation of majority-minority districts, with African-Americans packed into as small a number of districts as possible and with the rest then scattered across a large number of remaining districts, is precisely what one would do under classic gerrymandering (packing and cracking) designed to limit, not enable, the political influence of such groups. With the passage of these amendments to the Voting Rights Act in 1982, and then a Supreme Court decision in 1986 which upheld this (Thornburg v. Gingles), Republicans realized in the redistricting following the 1990 census that they could then, in those states where they controlled the process, use this as a means to gerrymander districts to their political advantage. Newt Gingrich, in particular, encouraged this strategy, and the resulting Republican gains in the South in 1992 and 1994 were an important factor in leading to the Republican take-over of the Congress following the 1994 elections (for the first time in 40 years), with Gingrich then becoming the House Speaker. Note also that while the Supreme Court, in a 5-4 decision in 2013, essentially gutted a key section of the Voting Rights Act, the section they declared to be unconstitutional was Section 5. This was the section that required pre-approval by federal authorities of changes in voting statutes in those jurisdictions of the country (mostly the states of the South) with a history of discrimination as defined in the statute. Left in place was Section 2 of the Voting Rights Act, the section under which the gerrymandering of districts on racial lines has been justified. It is perhaps not surprising that Republicans have welcomed keeping this Section 2 while protesting Section 5. One should also recognize that this racial gerrymandering of districts in the South has not led to most African-Americans in the region being represented in Congress by African-Americans. One can calculate from the raw data (reported here in Ballotpedia, based on US Census data), that as of 2015, 12 of the 71 congressional districts in the core South (Louisiana, Mississippi, Alabama, Georgia, South Carolina, North Carolina, Virginia, and Tennessee) had a majority of African-American residents. These were all just a single district in each of the states, other than two in North Carolina and four in Georgia. But the majority of African Americans in those states did not live in those twelve districts. Of the 13.2 million African-Americans in those eight states, just 5.0 million lived in those twelve districts, while 8.2 million were scattered around the remaining districts. By packing as many African-Americans as possible in a small number of districts, the Republican legislators were able to create a large number of safe districts for their own party, and the African-Americans in those districts effectively had little say in who was then elected. The Voting Rights Act was an important measure forward, drafted in reaction to the Jim Crow laws that had effectively undermined the right to vote of African-Americans. And defined relative to the Jim Crow system, it was progress. However, relative to a system that draws up district lines in a fair and unbiased manner, it would be a step backwards. A system where minorities are packed into a small number of districts, with the rest then scattered across most of the districts, is just standard gerrymandering designed to minimize, not to ensure, the political rights of the minority groups. Politicians drawing district lines to favor one party and to ensure their own re-election fundamentally undermines democracy. Supreme Court justices have themselves called it “distasteful”. However, to address gerrymandering the court has sought some measure which could be used to ascertain whether the resulting voting outcomes were biased to a degree that could be considered unconstitutional. But this is not the right question. One does not judge other aspects of whether the voting process is fair or not by whether the resulting outcomes were by some measure “excessively” affected or not. It is not clear why such an approach, focused on vote outcomes, should apply to gerrymandering. Rather, the focus should be on whether the process followed was fair and unbiased or not. And one can certainly define a fair and unbiased process to draw district lines. The key is that the process, once established, should be automatic and follow the agreed set of basic principles that define what the districts should be – that they should be of similar population, compact, contiguous, and where possible and consistent with these principles, follow the lines of existing political jurisdictions. One such process was outlined above. But there are other possibilities. The key is that the courts should require, in the name of ensuring a fair vote, that states must decide on some such process and implement it. And the citizenry should demand the same. Since taking office just two years ago, the Trump administration has done all it legally could to undermine Obamacare. 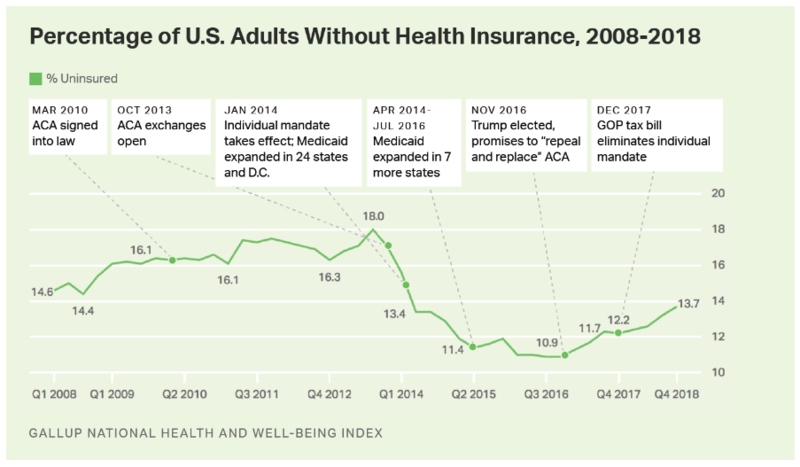 The share of the US population without health insurance had been brought down to historic lows under Obama, but they have now moved back up, with roughly half of the gains now lost. The chart above (from Gallup) traces its path. This vulnerability of health cover gains to an antagonistic administration has led many Democrats to look for a more fundamental reform that would be better protected. Many are now calling for an expansion of the popular and successful Medicare program to the full population – it is currently restricted just to those aged 65 and above. Some form of Medicare-for-All has now been endorsed by most of the candidates that have so far announced they are seeking the Democratic nomination to run for president in 2020, although the specifics differ. But while Medicare-for-All is popular as an ultimate goal, the path to get there as well as specifics on what the final structure might look like are far from clear (and differ across candidates, even when different alternatives are each labeled “Medicare-for-All”). There are justifiable concerns on whether there will be disruptions along the way. And the candidates favoring Medicare-for-All have yet to set out all the details on how that process would work. But there is no need for the process to be disruptive. The purpose of this blog post is to set out a possible path where personal choice in a system of market competition can lead to a health insurance system where Medicare is at least available for all who desire it, and where the private insurance that remains will need to be at least as efficient and as attractive to consumers as Medicare. The specifics will be laid out below, but briefly, the proposal is built around two main observations. One is that Medicare is a far more efficient, and hence lower cost, system than private health insurance is in the US. As was discussed in an earlier post on this blog, administrative expenses account for only 2.4% of the cost of traditional Medicare. All the rest (97.6%) goes to health care providers. Private health insurers, in contrast, have non-medical expenses of 12% of their total costs, or five times as much. Medicare is less costly to administer as it is a simpler system and enjoys huge economies of scale. Private health insurers, in contrast, have set up complex systems of multiple plans and networks of health care providers, pay very generous salaries to CEOs and other senior staff who are skilled at operating in the resulting highly fragmented system, and pay out high profits as well (that in normal years account for roughly one-quarter of that 12% margin). With Medicare so much more efficient, why has it not pushed out the more costly private insurance providers? The answer is simple: Congress has legislated that Medicare is not allowed to compete with them. And that is the second point: Remove these legislated constraints, and allow Medicare-managed plans to compete with the private insurance companies (at a price set so that it breaks even). Americans will then be able to choose, and in this way transition to a system where enrollment in Medicare-managed insurance services is available to all. And over time, such competition can be expected to lead most to enroll in the Medicare-managed options. They will be cheaper for a given quality, due to Medicare’s greater efficiency. There will still be a role for private insurance. For those competing with Medicare straight on, the private insurers that remain will have to be able to provide as good a product at as good a cost. But also, private insurers will remain to offer insurance services that supplement what a Medicare insurance plan would provide. Such optional private insurance would cover services (such as dental services) or costs (Medicare covers just 80% after the deductible) that the basic Medicare plan does not cover. Medicare will then be the primary insurer, and the private insurance the secondary. And, importantly, note that in this system the individual will still be receiving all the services that they receive under their current health plans. This addresses the concern of some that a Medicare-like plan would not be as complete or as comprehensive as what they might have now. With the optional supplemental, their insurance could cover exactly what they have now, or even more. Medicare would be providing a core level of coverage, and then, for those who so choose, supplemental private plans can bring the coverage to all that they have now. But the cost will be lower, as they will gain from the low cost of Medicare for those core services. More specifically, how would this work? A central part of the Obamacare reforms was the creation of a marketplace where individuals, who do not otherwise have access to a health insurance plan (such as through an employer), could choose to purchase an individual health insurance plan. As originally proposed, and indeed as initially passed by the House of Representatives, a publicly managed health insurance plan would have been made available (at a premium rate that would cover its full costs) in addition to whatever plans were offered by private insurers. This would have addressed the problem in the Obamacare markets of often excessive complexity (with constantly changing private plans entering or leaving the different markets), as well as limited and sometimes even no competition in certain regions. A public option would have always been available everywhere. But to secure the 60 votes needed to pass in the Senate, the public option had to be dropped (at the insistence of Senator Joe Lieberman of Connecticut). It could, and should, be introduced now. Such a public option could be managed by Medicare, and could then piggy-back on the management systems and networks of hospitals, doctors, and other health care providers who already work with Medicare. However, the insurance plan itself would be broader than what Medicare covers for the elderly, and would meet the standards for a comprehensive health care plan as defined under Obamacare. Medicare for the elderly is, by design, only partial (for example, it covers only 80% of the cost, after a modest deductible), plus it does not cover services such as for pregnancies. A public option plan administered by Medicare in the Obamacare marketplace would rather provide services as would be covered under the core “silver plan” option in those markets (the option that is the basis for the determination of the subsidies for low-income households). And one might consider offering as options plans at the “bronze” and “gold” levels as well. Such a Medicare-managed public option would provide competition in the Obamacare exchanges. An important difficulty, especially in the Republican states that have not been supportive of offering such health insurance, is that in certain states (or counties within those states) there have been few health insurers competing with each other, and indeed often only one. The exchanges are organized by state, and even when insurers decide to offer insurance cover within some state, they may decide to offer it only to residents of certain counties within that state. The private insurers operate with an expensive business model, built typically around organizing networks of doctors with whom they negotiate individual rates for health care services provided. It is costly to set this up, and not worthwhile unless they have a substantial number of individuals enrolled in their particular plan. But one should also recognize that there is a strong incentive in the current Obamacare markets for an individual insurer to provide cover in a particular area if no other insurer is there to compete with them. That is because the federal subsidy to a low-income individual subscribing to an insurance plan depends on the difference between what insurers charge for a silver-level plan (specifically the second lowest cost for such a plan, if there are two or more insurers in the market) and some given percentage of that individual’s household income (with that share phased out for higher incomes). What that means is that with no other insurer providing competition in some locale, the one that is offering insurance can charge very high rates for their plans and then receive high federal subsidies. The ones who then lose in this (aside from the federal taxpayer) are households of middle or higher income who would want to purchase private health insurance, but whose income is above the cutoff for eligibility for the federal subsidies. The result is that the states with the most expensive health insurance plan costs are those that have sought to undermine the Obamacare marketplace (leading to less competition), while the lowest costs are in those states that have encouraged the Obamacare exchanges and thus have multiple insurers competing with each other. For example, the two states with the most expensive premium rates in 2019 (average for the benchmark silver plans) were Wyoming (average monthly premium for a 40-year-old of $865, before subsidies) and Nebraska (premium of $838). Each had only one health insurer provider on the exchanges. At the other end, the five states with the least expensive average premia, all with multiple providers, were Minnesota ($326), Massachusetts ($332), Rhode Island ($336), Indiana ($339), and New Jersey ($352). These are not generally considered to be low-cost states, but the cost of the insurance plans in Wyoming and Nebraska were two and a half times higher. The competition of a Medicare-managed public provider would bring down those extremely high insurance costs in the states with limited or no competition. And at such lower rates, the total being spent by the federal government to support access by individuals to health insurance will come down. But to achieve this, Congress will have to allow such competition from a public provider, and management through Medicare would be the most efficient way to do this. One would still have any private providers who wish to compete. But consumers would then have a choice. While the market for individual health insurance cover is important to extending the availability of affordable health care to those otherwise without insurance cover, employer-sponsored health insurance plans account for a much higher share of the population. Excluding those with government-sponsored plans via Medicare, Medicaid, and other such public programs, employer-sponsored plans accounted for 76% of the remaining population, individual plans for 11%, and the uninsured for 14%. These employer-sponsored plans are dominant in the US for historical reasons. They receive special tax breaks, which began during World War II. Due to the tax breaks, it is cheaper for the firm to arrange for employee health insurance through the firm (even though it is in the end paid for by the employee, as part of their total compensation package), than to pay the employee an overall wage with the employee then purchasing the health insurance on his or her own. The employer can deduct it as a business expense. But this has led to the highly fragmented system of health insurance cover in the US, with each employer negotiating with private insurers for what will be provided through their firm, with resulting high costs for such insurance. As many have noted, no one would design such a health care funding system from scratch. But it is what the US has now, and there is justifiable concern over whether some individuals might encounter significant disruptions when switching over to a more rational system, whether Medicare-for-All or anything else. It is a concern which needs to be respected, as we need health care treatment when we need it, and one does not want to be locked out of access, even if temporarily, during some transition. How can this risk be avoided? One could manage this by avoiding a compulsory switch in insurance plans, but rather provide as an option insurance through a Medicare-managed plan. That is, a Medicare-managed insurance plan, similar in what is covered to current Medicare, would be allowed to compete with current insurance providers, and employers would have the option to switch to that Medicare plan, either immediately or at some later point, as they wish, to manage health insurance for their employees. Furthermore, this Medicare-managed insurance could serve as a core insurance plan, to be supplemented by a private insurance plan which could cover costs and health care services that Medicare does not cover (such as dental and vision). These could be similar to Medicare Supplement plans (often called a Medigap plan), or indeed any private insurance plan that provides additional coverage to what Medicare provides. Medicare is then the primary insurer, while the private supplemental plan is secondary and covers whatever costs (up to whatever that supplemental plan covers) that are not paid for under the core Medicare plan. In this way, an individual’s effective coverage could be exactly the same as what they receive now under their current employer-sponsored plan. Employers would still sponsor these supplemental plans, as an addition to the core Medicare-managed plan that they would also choose (and pay for, like any other insurance plan). But the cost of the Medicare-managed plus private supplemental plans would typically be less than the cost of the purely private plans, due to the far greater efficiency of Medicare. And with this supplemental coverage, one would address the concern of many that what they now receive through their employer-sponsored plan is a level of benefits that are greater than what Medicare itself covers. They don’t want to lose that. But with such supplemental plans, one could bring what is covered up to exactly what they are covering now. This is not uncommon. Personally, I am enrolled in Medicare, while I have (though my former employer) additional cover by a secondary private insurer. And I pay monthly premia to Medicare and through my former employer to the private insurer for this coverage (with those premia supplemented by my former employer, as part of my retirement package). With the supplemental coverage, I have exactly the same health care services and share of costs covered as what I had before I became eligible for Medicare. But the cost to me (and my former employer) is less. One should recognize that for retirees this is in part due to Medicare for the elderly receiving general fiscal subsidies through the government budget. But the far greater efficiency of Medicare that allows it to keep its administrative costs low (at just 2.4% of what it spends, with the rest going to health care service providers, as compared to a 12% cost share for private insurance) would lead to lower costs for Medicare than for private providers even without such fiscal support. Such supplemental coverage is also common internationally. Canada and France, for example, both have widely admired single-payer health insurance systems (what Medicare-for-All would be), and in both one can purchase supplemental coverage from private insurers for costs and services that are not covered under the core, government managed, single-payer plans. Under this proposed scheme for the US, the decision by a company of whether to purchase cover from Medicare need not be compulsory. The company could, if it wished, choose to remain with its current private insurer. But what would be necessary would be for Congress to remove the restriction that prohibits Medicare from competing with private insurance providers. Medicare would then be allowed to offer such plans at a price which covers its costs. Companies could then, if they so chose, purchase such core cover from Medicare and additionally, to supplement such insurance with a private secondary plan. One would expect that given the high cost of medical services everywhere (but especially in the US) they will take a close look at the comparative costs and value provided, and choose the plan (or set of plans) which is most advantageous to them. Over time, one would expect a shift towards the Medicare-managed plans, given its greater efficiency. And private plans, in order to be competitive for the core (primary) insurance available from Medicare, would be forced to improve their own efficiency, or face a smaller and smaller market share. If they can compete, that is fine. But given their track record up to now, one would expect that they will leave that market largely to Medicare, and focus instead on providing supplemental coverage for the firms to select from. An issue to consider, but which can be addressed, is whether in such a system the private insurers will be able to “cherry-pick” the more lucrative, lower risk, population, leaving those with higher health care costs to the Medicare-managed options. The result would be higher expenses for the public options, which would require them either to raise their rates (if they price to break even) or require a fiscal subsidy from the general government budget. And if the public options were forced to raise their rates, there would no longer be a level playing field in the market, effective competition would be undermined, and lower-efficiency private insurers could then remain in the market, raising our overall health system costs. This is an issue that needs to be addressed in any insurance system, and was addressed for the Obamacare exchanges as originally structured. While the Trump administration has sought to undermine these, they do provide a guide to what is needed. Specifically, all insurers on the Obamacare exchanges are required to take on anyone in the geographic region who chooses to enroll in their particular plan, even if they have pre-existing conditions. This is the key requirement which keeps private insurers from cherry-picking lower-cost enrollees, and excluding those who will likely have higher costs. However, this then needs to be complemented with: 1) the individual mandate; 2) minimum standards on what constitutes an adequate health insurance plan; and 3) what is in essence a reinsurance system across insurers to compensate those who ended up with high-cost enrollees, by payments from those insurers with what turned out to be a lower cost pool (the “risk corridor” program). These were all in the original Obamacare system, but: 1) the individual mandate was dropped in the December 2017 Republican tax cut (after the Trump administration said they would no longer enforce it anyway); 2) the Trump administration has weakened the minimum standards; and 3) Senator Marco Rubio was able in late 2015 to insert a provision in a must-pass budget bill which blocked any federal spending to even out payments in the risk corridor program. Without these measures, it will be impossible to sustain the requirement that insurers provide access to everyone, at a price which reflects the health care risks of the population as a whole. With no individual mandate, those who are currently healthy could choose to free-ride on the system, and enroll in one of the health care plans only when they might literally be on the way to the hospital, or, in a less extreme example, only aim to enroll at the point when they know they will soon have high medical expenses (such as when they decide to have a baby, or to have some non-urgent but expensive medical procedure done). The need for good minimum standards for health care plans is related to this. Those who are relatively healthy might decide to enroll in an insurance plan that covers little, but, when diagnosed with say a cancer or some other such medical condition, then and only then enroll in a medical insurance plan that provides good cover for such treatments. The good medical insurance plans would either soon go bankrupt, or be forced also to reduce what they cover in a race to the bottom. Finally, risk sharing across insurers is in fact common (it is called reinsurance), and was especially important in the new Obamacare markets as the mix of those who would enroll in the plans, especially in the early years, could not be known. Thus, as part of Obamacare, a system of “risk corridors” was introduced where insurers who ended up with an expensive mix of enrollees (those with severe medical conditions to treat) would be compensated by those with an unexpectedly low-cost mix of enrollees, with the federal government in the middle to smooth out the payments over time. The Congressional Budget Office estimated in 2014 that while the payment flows would be substantial ($186 billion over ten years) the inflows would match the outflows, leaving no net budgetary cost. However, Senator Rubio’s amendment effectively blocked this, as he (incorrectly) characterized the risk corridor program to be a “bailout” fund for the insurers. But the effect of Rubio’s amendment was to lead smaller insurers and newly established health care coops to exit the market (as they did not have the financial resources to wait for inflows and outflows to even out), reducing competition by leaving only a limited number of the large, deep pocket, insurers who could survive such a wait, and then, with the more limited competition, jack up the insurance premia rates. The result, as we will discuss immediately below, was to increase, not decrease, federal budgetary costs, while pricing out access to the markets of those with incomes too high to receive the federal subsidies. Despite these efforts to kill Obamacare and block the extension of health insurance coverage to those Americans who have not had it, another provision in the Obamacare structure has allowed it to survive, at least so far and albeit in a more restrictive (but higher cost) form. And that is due to the way the system of federal subsidies are provided to those of lower-income households in order to make it possible for them to purchase health insurance at a price they can afford. As discussed above, these federal subsidies cover the difference between some percentage of a household’s income (with that percentage depending on their income) and the cost of a benchmark silver-level plan in their region. More specifically, those with incomes up to 400% of the federal poverty line (400% would be $49,960 for an individual in 2019, or $103,000 for a family of four) are eligible to receive a federal subsidy to purchase a qualifying health insurance plan. The subsidy is equal to the difference between the cost of the benchmark silver-level plan and a percentage of their income, on a sliding scale that starts at 2.08% of income for those earning 133% of the poverty line, and goes up to 9.86% for those earning 400%. The mathematical result of this is that if the cost of the benchmark health insurance plan goes up by $1, they will receive an extra $1 of subsidy (as their income, and hence their contribution, is still the same). The result is that measures such as the blocking of the risk corridor program by Senator Rubio’s amendment, or the Trump administration’s decision not to enforce (and then to remove altogether) the individual mandate, or the weakening the standards of what has to be covered in a qualifying health insurance plan, have all had the effect of the insurance companies being forced to raise the insurance premium rates sharply. While those with incomes up to 400% of the poverty line were not affected by this (they pay the same share of their income), those with incomes higher than the 400% limit have been effectively priced out of these markets. Only those (whose incomes are above that 400%) with some expensive medical condition might remain, but this then further biases the risk pool to those with high medical expenses. Finally and importantly, these measures to undermine the markets have led to higher, not lower, federal budgetary costs, as the federal subsidies go up dollar for dollar with the higher premium rates. So we know how to structure the markets to ensure there will be no cherry-picking of low risk, low cost, enrollees, leaving the high-cost patients for the Medicare-managed option. But it needs to be done. The requirement that all the insurance plans accept any enrollee will stop this. This then needs to be complemented with the individual mandate, minimum standards for the health insurance plans, and some form of risk corridors (reinsurance) program. The issue is not that this is impossible to do, but rather that the Trump administration (and Republicans in Congress) have sought to undermine it. This discussion has been couched in terms of the market for individual insurance plans, but the same principles apply in the market for employer-sponsored health insurance. While not as much discussed, the Affordable Care Act also included an employer mandate (phased in over time), with penalties for firms with 50 employees or more who do not offer a health insurance plan meeting minimum standards to their employees. There were also tax credits provided to smaller firms who offer such insurance plans. But the cherry-picking concern is less of an issue for such employer-based coverage than it is for coverage of individuals. 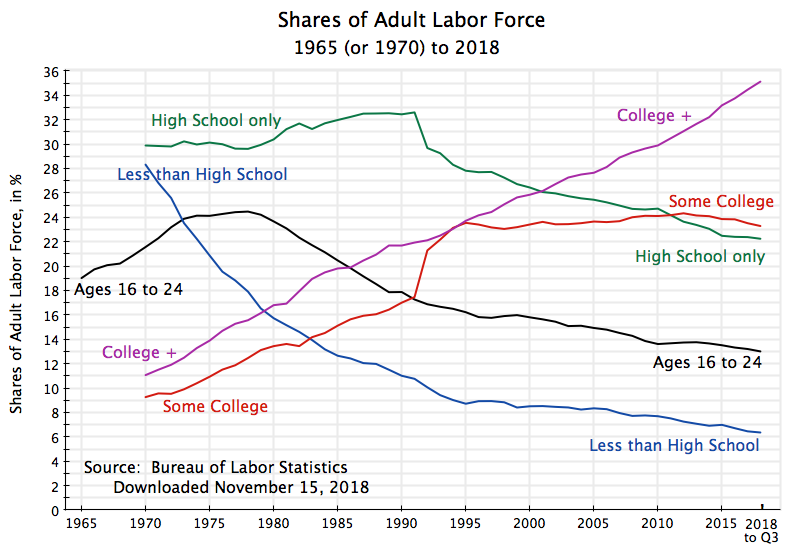 This is because there will be a reasonable degree of risk diversification across individuals (the mix of those with more expensive medical needs and those with less) even with just 100 employees or so. And smaller firms can often subscribe together with others in the industry to a plan that covers them as a group, thus providing a reasonable degree of diversification. With the insurance covering everyone in the firm (or group of firms), there will be less of a possibility of trying to cherry-pick among them. The possibility of cherry-picking is therefore something that needs to be considered when designing some insurance system. If not addressed, it could lead to a loading of the more costly enrollees onto a public option, thus increasing its costs and requiring either higher premia to subscribe to it or government budget support. But we know how to address the issue. The primary tool, which we should want in any case, is to require health insurers to be open to any enrollees, and not block those with pre-existing conditions. But this then needs to be balanced with the individual mandate, minimum standards for what qualifies as a genuine health insurance plan, and means to reinsure exceptional risks across insurers. The Obamacare reforms had these, and one cannot say that we do not know how to address the issue. These proposals are not radical. And while there has been much discussion of allowing a public option to provide competition for insurance plans in the Obamacare markets, I have not seen much discussion of allowing a Medicare-managed option in the market for employer-sponsored health insurance plans. Yet the latter market is far larger than the market for private, individual, plans, and a key part of the proposal is to allow such competition here as well. Allowing such options would enable a smooth transition to Medicare-managed health insurance that would be available to all Americans. And over time one would expect many if not most to choose such Medicare-managed options. Medicare has demonstrated that it is managed with far great efficiency than private health insurers, and thus it can offer better plans at lower cost than private insurers currently do. If the private insurers are then able to improve their competitiveness by reducing their costs to what Medicare has been able to achieve, then they may remain. But I expect that most of them will choose to compete in the markets for supplemental coverage, offering plans that complement the core Medicare-managed plan and which would offer a range of options from which employers can choose for their employer-sponsored health insurance cover. Conservatives may question, and indeed likely will question, whether government-managed anything can be as efficient, much less more efficient, than privately provided services. While the facts are clear (Medicare does exist, we have the data on what it costs, and we have the data on what private health insurance costs), some will still not accept this. However, with such a belief, conservatives should not then be opposed to allowing Medicare-managed health insurance options to compete with the private insurers. If what they believe is true, the publicly-managed options would be too expensive for an inferior product, and few would enroll in it. But I suspect that the private insurers realize they would not be able to compete with the Medicare-managed insurance options unless they were able to bring their costs down to a comparable level. And they do not want to do this as they (and their senior staff) benefit enormously from the current fragmented, high cost, system. That is, there are important vested interests who will be opposed to opening up the system to competition from Medicare-managed options. It should be no surprise that they, and the politicians they contribute generously to, will be opposed. Just a quick note on this Christmas Eve. The US stock markets are falling. The bull market that had started in March 2009, two months after Obama took office, and which then continued through to the end of Obama’s two terms, may be close to an end. A bear market is commonly defined as one where the S&P500 index (a broad stock market index that most professionals use) has fallen by 20% or more from its previous peak. As of the close of the markets this December 24, the S&P500 index is 19.8% below the peak it had reached on September 20. The NASDAQ index is already in bear market territory, as it is 23.6% lower than its previous peak. And the Dow Jones Industrial average is also close, at a fall of 18.8% from its previous peak. Trump is blaming the Fed for this. The Fed has indeed been raising interest rates, since 2015. The Fed had kept interest rates at close to zero since the financial collapse in 2008 at the end of the Bush administration in order to spur a recovery. And it had to keep interest rates low for an especially long time as fiscal policy turned from expansionary, in 2009/10, to contractionary, as the Republican Congress elected in 2010 forced through cuts in government spending even though employment had not yet then fully recovered. Employment did eventually recover, so the Fed could start to bring interest rates back to more normal levels. This began in late 2015 with an increase in the Fed’s target for the federal funds rate from the previous range of 0% to 0.25%, to a target range of 0.25% to 0.50%. The federal funds rate is the rate at which banks borrow or lend federal funds (funds on deposit at the Fed) to each other, so that the banks can meet their deposit reserve requirements. And the funds are borrowed and lent for literally just one night (even though the rates are quoted on an annualized basis). The Fed manages this by buying and selling US Treasury bills on the open market (thus loosening or tightening liquidity), to keep the federal funds rate within the targeted range. Since the 2015 increase, the Fed has steadily raised its target for the federal funds rate to the current range of 2.25% to 2.50%. It raised the target range once in 2016, three times in 2017, and four times in 2018, always in increments of 0.25% points. The market has never been surprised. 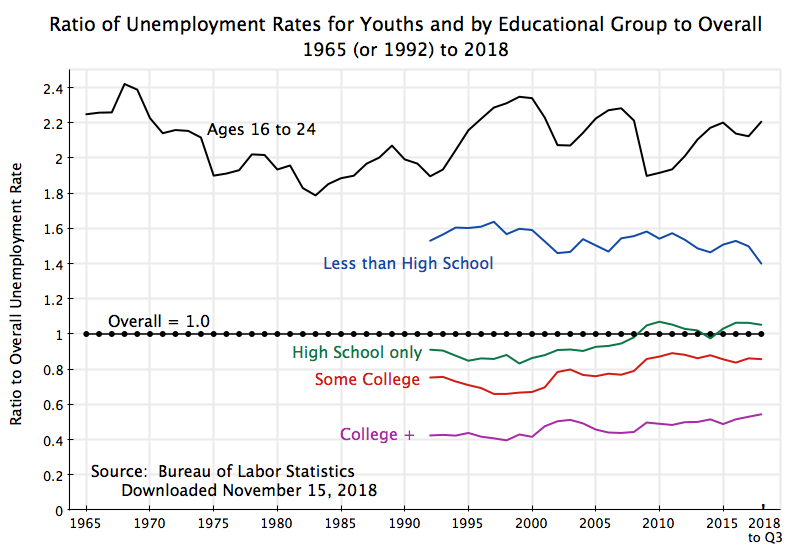 With unemployment having fallen to 5.0% in late 2015, and to just 3.7% now, this is exactly one would expect the Fed to do. Those paths were roughly similar up to September 2018, and only then did they diverge. That is, the Fed has been raising interest rates for several years now, and the stock market was also steadily rising. 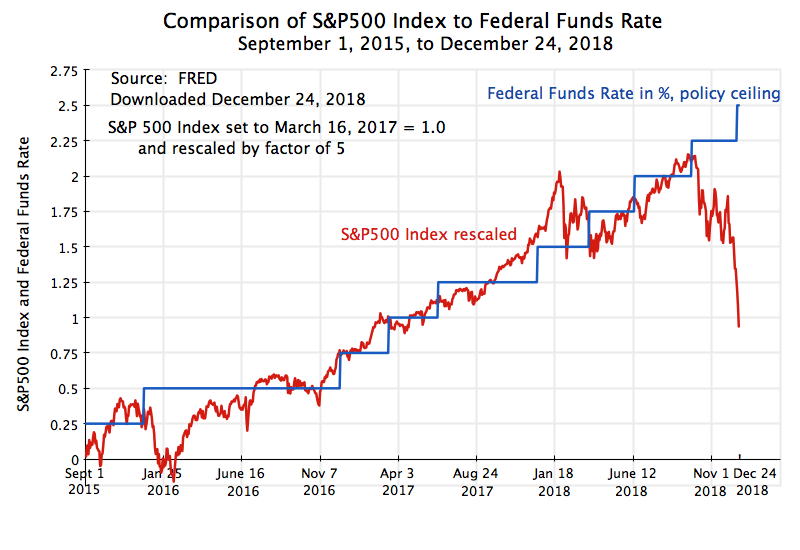 Increases in the federal funds rate by the Fed in those years did not cause the stock market to fall. It is disingenuous to claim that it has now. Why is the stock market now falling then? While only fools claim to know with certainty what the stock market will do, or why it has moved as it has, Trump’s claim that it is all the Fed’s fault has no basis. The Fed has been raising interest rates since 2015. Rather, Trump should be looking at his own administration, capped over the last few days with the stunning incompetence of his Treasury Secretary, Steven Mnuchin. With a perceived need to “do something” (probably at Trump’s instigation), Mnuchin made a big show of calling on Sunday the heads of the six largest US banks asking if they were fine (they were, at least until they got such calls, and might then have been left wondering whether the Treasury Secretary knew something that they didn’t), and then organizing a meeting of the “Plunge Protection Team” on Monday, Christmas Eve. This all created the sense of an administration in panic. This comes on top of the reports over the weekend that Trump wants to fire the Chairman of the Fed, Jerome Powell. Trump had appointed Powell just last year. Nor would it be legal to fire him (and no president ever has), although some may dispute that. Finally, and adding to the sense of chaos, a major part of the federal government is on shutdown starting from last Friday night, as Trump refused to approve a budget extension unless he could also get funding to build a border wall. As of today, it does not appear this will end until some time after January 1. But it is not just these recent events which may have affected the markets. After all, the S&P500 index peaked on September 20. Rather, one must look at the overall mismanagement of economic policy under Trump, perhaps most importantly with the massive tax cut to corporations and the wealthy of last December. While a corporate tax cut will lead to higher after-tax corporate profits, all else being equal, all else will not be equal. The cuts have also contributed to a large and growing fiscal deficit, to a size that is unprecedented (even as a share of GDP) during a time of full employment (other than during World War II). A federal deficit which is already high when times are good will be massive when the next downturn comes. This will then constrain our ability to address that downturn. Plus there are other issues, such as the trade wars that Trump appears to take personal pride in, and the reversal of the regulatory reforms put in place after the 2008 economic and financial collapse in order not to repeat the mistakes that led to that crisis. What will happen to the stock market now? I really do not know. Perhaps it will recover from these levels. But with the mismanagement of economic policy seen in this administration, and a president who acts on whim and is unwilling to listen, it would not be a surprise to see a further fall. Just don’t try to shift the blame to the Fed.